G'day dear friends! 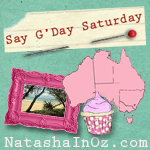 Welcome to this week's Say G'day Saturday Linky party! 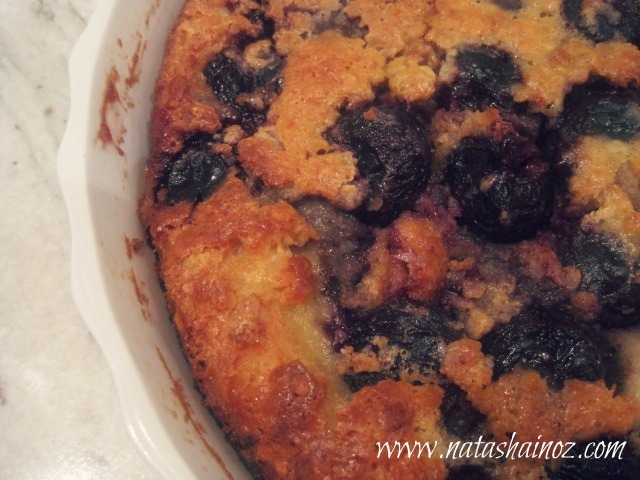 When Maddy and I decided that we were going to make Cherry Clafoutis (pronounced kla-foo-TEE) for a dinner party we figured we'd google the recipe and easily find one. How wrong we were! 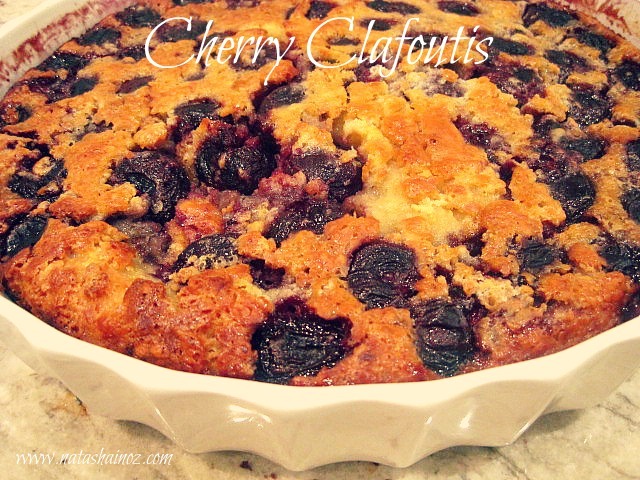 There are dozens of different clafoutis recipes out there in cyberspace! Each recipe is unique and they all looked equally delicious. I think our version of the recipe was just as delicious as all the other ones out there! The clafoutis comes from the Limousin region of France. Traditionally, black cherries are used in the recipe but there are numerous variations using other fruits including red cherries, plums, prunes, apples, cranberries or blackberries.When other kinds of fruit are used instead of cherries, the dish is properly called a flaugnarde. The recipe we used is not from one source but it is an amalgamation of a few. Traditional clafoutis recipes suggest using cherries with their pits still in to lend some flavour to the dish. As it is not cherry season here we used canned cherries and we think the flavour was still divine! Our guests thought it was delicious too! The end product was quite incredible because it had just the right texture between custard and cake. If you want to make a dessert that has a certain je ne sais quoi with very little effort then you must try cherry clafoutis! 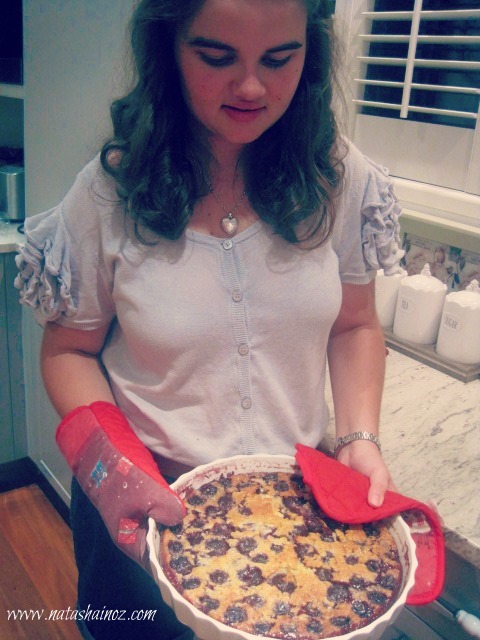 @maddyminnie made the most divine cherry clafoutis for dessert tonight! This delicious Cherry Clafoutis Recipe is French in origin. Black cherries are used in the recipe but other fruits such as plums, prunes or blackberries can be used. Pre-heat the oven to 190 C or 380 F. Beat the sugar and the eggs until they lighten in colour. Gradually add the butter, beating to incorporate. Add the flour all and whisk until combined. Slowly pour in the milk a little at a time then add the vanilla and almond extract. The batter should be smooth and glossy. Place the fruit in a buttered 10 inch pie plate that has been sprinkled with 1 tablespoon of sugar over the bottom. It also looks very rustic when served in a skillet that is oven proof. Pour the batter over the fruit. Bake in the pre-heated oven for approximately 30-40 minutes until slightly browned and almost completely set in the middle. Let sit at least 15 minutes before serving. The clafoutis will puff up quite a bit while cooking and will then deflate while cooling-don't be alarmed when this happens! When it has cooled down a little dust with powdered sugar and serve with cream, ice cream, custard, creme fraiche...whatever you like.It is delicious warm or at room temperature. It is also delicious served cold the next day...yum! 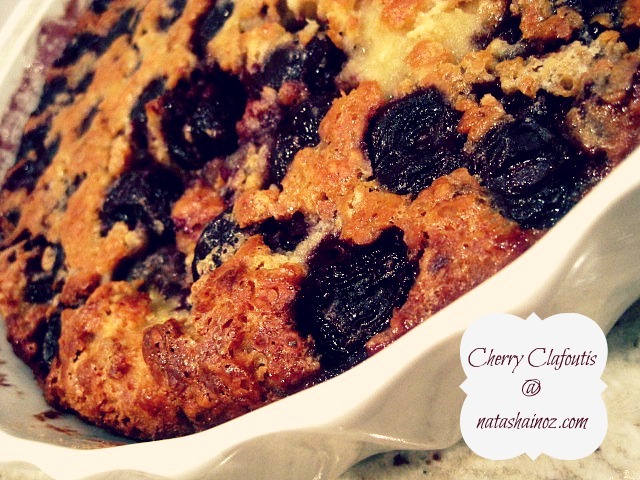 I hope that you will give this delicious version of the Cherry Clafoutis recipe a try-please let me know if you do! I sure do hope you will be able to join me every weekend to share your favourite posts about anything at all! If you would like to link up a post about your favourite recipe, craft, idea, tutorial or DIY project to my Say G'day Saturday Linky Party, please just add the url of your particular blog post that you would like us to visit to the Linky tool. Also, I just wanted to remind my new bloggy friends that I have created a central list of Blogging Pinners so we can all find each other's Pinterest pages more easily. It's called the Pinning Bloggers Master List and anyone who has a Pinterest account is welcome to link up! Just click here to link up! Thank you so much for linking up and for joining in with my weekly Say G'day Saturday Linky Party this week. This weekend is a long one for us to celebrate the Queen's Jubilee so I'm going to use it to catch up with some reading, baking and blogging! 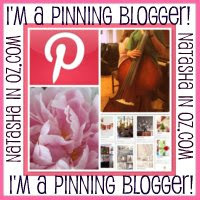 I hope to see you at your bloggy home soon! I also hope that wherever you are in the world, your weekend is full of happiness, sunshine and warmth! This looks delicious Natasha. Anything with fruit and custard sounds yummy. Thank you for hosting and for joining me at Home Sweet Home! Thank you for hosting!Have a great weekend! This looks awesome! I've never heard of Clafoutis...but I love custard. I'm glad you mentioned using canned cherries since they're very expensive to get here fresh. Can you make this with other berries? like blueberries? I have a lot of blueberries to use up in my freezer. This may just be the key. I think leaving the pits in the cherries would ruin the dish. Yuck. Imagine your guests or family biting down on a hard pit then having to swizzle it around in their mouths so they could delicately spit it into their spoon and put it .... where? i've tweeted & linked ~see you later! Natasha, I know I'd like this. Looks delicious! Never heard of it, but it looks good! Thanks, Natasha for making another Saturday so full of fun and inspiration. Hope you are having a great weekend. How are you this rainy grey day? Hope you are enjoying the long weekend though :) Thanks for hosting!! I love cherries and will be sure to try your recipe. I had some great posts this week and would love to share but I'm away from home and trying to link up from my phone would be difficult. 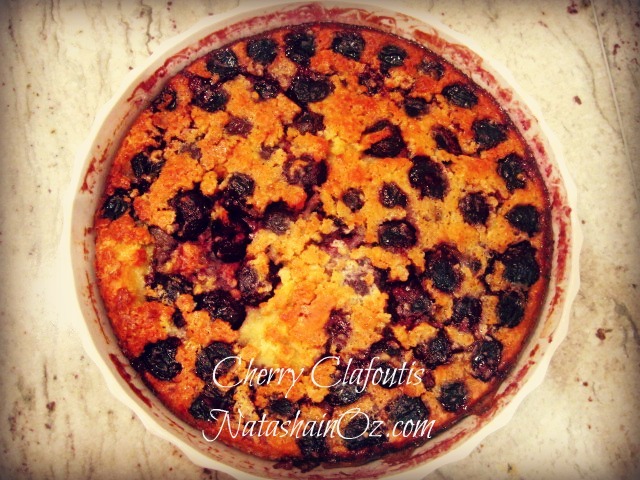 Wow - your cherry clafoutis does look amazing!! Nice job. I'm definitely pinning this. Thanks for linking up at Romance on a dime! WoW - Looks divine and tempting.... !! Your Cherry Clafoutis looks beautiful, wish I had a nice slice. Hope you are having a great week and thank you so much for sharing with Full Plate Thursday. Yum--I think I have everything in the house, but the cherries, to make this, too! Might have to make a trip to the store, soon! Thank you for posting, and your food photographs were great--I have not learned that skill yet, so well done! Thanks so much for stopping by Creative Thursday this week. I couldn’t do these parties without you. Can’t wait to see what you link up next week. Have a wonderful weekend. I'll be back to grab this recipe next time I'm looking for a special dessert. This looks like my kind of yumminess! Mmmm, MMM, does that look good! I'll be featuring you yummy dish tomorrow for Feature Friday FREE-FOR-ALL!